First Things First ~ Don't Be Scammed Buying A Pup Online! 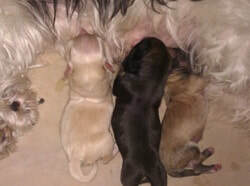 ~~ if they have many, many litters at a time and they don't have kennel staff you might want to go elsewhere. ~~If you see 20 toy~sized pups on someone's site (especially if they are all different breeds), beware~go elsewhere! Breeding litters requires cleanliness. The more pups you have, the more diligent you must be in keeping your environment clean. When a breeder has several puppies, it may drive down the price of the puppy but you may end up with expensive vet fees & terrible heartache! This would surely not be worth the difference in cost. If a breeder has a legitimate kennel, you might want to check them out in person. Prepare yourself to walk away if everything is not as it should be. Now, there are exceptions..but the exception is rare...so go visit. See how it looks and how it smells. You might not see uncleanliness...but you can almost always smell it. Especially when it is covered up by Pine~Sol or bleach. 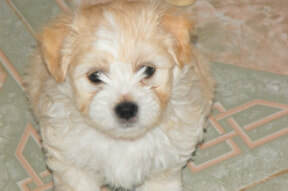 Also know that the puppy pictures you see on a breeders site, may not actually be the real thing. How can you know?? Go to the home of the breeder, ask for references. Always ask for the phone number of the breeder's vet & actually call the vet. Anyone who has more than two dogs should be well known by their vet. If they don't have a vet...leave~quickly. Please, please do your homework. Don't buy on emotion just because the puppy is cute. Don't buy from breeders who cage their pets in unsanitary conditions....Milling is a horrific life for dogs. The only way Puppy Mills will shut down is if buyers don't buy! Now...that being said..... Welcome To Highborn!! 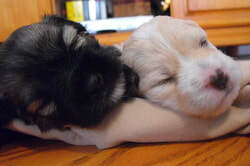 Our puppies are born and raised in our home with much attention and love. As you can see in our photos, our dogs live in a clean, safe and fun environment. Our pups are very well socialized and receive constant supervision. All Highborn puppies are AKC registered. If you are seriously interested in the show ring for your puppy, we will consider AKC Full Registration on an individual basis. However, most Highborn pups come with Limited AKC Registration. Registration papers will not be sent out until proof of spay/neuter is complete. ​We take pride in our puppies and thoroughly enjoy every stage of the breeding process. We expect our pups to be smart, easy to train, gentle...temperamentally sound and healthy. We begin weaning at about 3 1/2 to 5 weeks of age. Our pups are fed a mash of Life's Abundance and Goat's milk concoction and slowly weaned off the mash and fed Life's Abundance kibble w/a tiny bit of canned meat diet. These pups shown sleeping have just finished eating and their coats are great. Please look at the Life's Abundance Food tab. This food has done wonders for my dogs!! Who Can Have A Highborn Pup? ​We love all of our dogs. We do screen all prospective families to make sure our puppies go to a home where they will be well cared for. This is via phone call. We won't ask meaningless questions, we merely want to get to know our prospective families to ensure they will love these pups that we are entrusting to them. If you are interested in one of our puppies please contact us at Jules@HighbornHavanese.net or feel free to give me a call at 770-355-3580. I will answer any and all questions you may have or help you find a breeder that can better meet your needs!